WITH the January window fast approaching, clubs have an opportunity to reassess where their seasons are headed, and decide whether to improve the squad, or maintain the Status quo. It’s often been said by Sir Alex Ferguson that there is “no value” in the January market, as players’ values soar, and the best ones are invariably cup tied. Whilst that rings true, it is also true that if you look hard enough, there are plenty of bargains to be had. Let’s take a look at the state of United’s squad, and where Fergie might look to strengthen. Nikica Jelavić, Papiss Cissé and Luis Suárez are just three examples of players bought in January who have had an instant impact on their clubs. Manchester United rarely utilise the January window to make significant signings, with Ferguson preferring to make big moves in the early part of the summer window. This allows new signings to have a full preseason to settle in. His last January purchase was Anders Lindegaard in 2010 from Aalesunds. Going back 8 seasons to 2005, United snapped up Nemanja Vidić and Patrice Evra from Spartak Moscow and Monaco respectively for a combined fee of £12.5m. Having said that, do United have to make any serious plays in this window? And will they? Sir Alex Ferguson has come out and said he will definitely not be buying anybody in January, but that was before the dynamic was changed with the announcement that United were drawn to play Spanish giants Real Madrid in the last 16 of the UEFA Champions League. Let’s have a look at the squad situation, position by position, and whether signings are needed, as well as possible targets. With David De Gea and Anders Lindegaard in the squad, United are well stocked in the keeping department. Sam Johnstone provides additional cover, while promising young Academy graduate Ben Amos is currently on loan to Hull City in the Championship. Verdict: No signings are needed for a good couple of years, unless there are unexpected departures or Ferguson loses faith in one of his goalkeepers. Alternatively, whichever ‘keeper is on the bench most often, might seek a number one jersey at another club. Rafael is the incumbent in this position and has been outstanding this season, while the returning Phil Jones and Chris Smalling provide additional cover as well. Antonio Valencia and Darren Fletcher also provide options in a crisis. Young Belgian, Marnick Vermijl, is one to look out for in the reserves, as is Frederic Veseli. Verdict: No signings needed. There is plenty of competent cover, and there are a number of youthful options. Patrice Evra has recaptured some of his best form of late, while young Dutchman, Alexander Büttner provides additional cover. Fabio has been loaned out to QPR, and young Irish international Robbie Brady, has been loaned out to Hull City as well. Tyler Blackett continues to impress for the reserves, but nobody has made a big enough claim to usurp Patrice Evra. The question is whether Büttner is of sufficient standard to provide competition (or simply the option of rotation) for Evra. If not, this could be an area to address. It’s not impossible that Harry Redknapp may decide to terminate the loan of Fabio in order to free up a Premier League loan spot too. Verdict: No signings needed in January, but the pursuit of an experienced leftback to challenge, or replace Evra, may be on the agenda in the summer. Possible targets: Leighton Baines (Everton), Ashley Cole (Chelsea). An area of concern when Vidić, Jones and Smalling were all out injured at the same time. 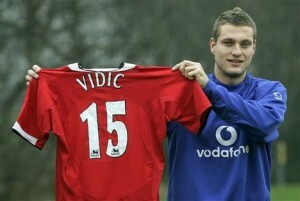 Nemanja Vidić has now made his return, as have Jones and Smalling. This has allowed for a lot more rotation. There is youthful backup in Scott Wootton, Michael Keane and Tom Thorpe. There is an increasing sense however, that this could be Rio Ferdinand’s last season at the club, as his contract runs out at the end of the current season and he is yet to negotiate an extension. Verdict: No signings needed in January, although a experienced defender could be targeted in the summer if Rio departs, or if there are continued injury problems for Vidić. Possible targets: Angelo Ogbonna (Torino), Mats Hummels (Borussia Dortmund), Ezequiel Garay (Benfica), Vegard Forren (Molde), Kurt Zouma (St Etienne). Antonio Valencia is the undoubted first choice on the right side of midfield for United, even though he is yet to find his very best form this season. Nani and Ashley Young could both operate down that side as well, while Darren Fletcher and Danny Welbeck have been utilised there on occasion. Verdict: The right flank appears to be in better shape than the left, and a signing in this area is only likely if it’s an adaptable player that Ferguson does not want to miss out on. Possible Targets: Theo Walcott (Arsenal), Wilfried Zaha (Crystal Palace), Erik Lamela (AS Roma). The summer captures of central attacking midfielders, Shinji Kagawa and Nick Powell, make a midfield diamond an attractive option. The out-of-favour and currently injured Nani, as well as the frustratingly inconsistent Ashley Young occupy the spots on the left. Shinji Kagawa is an option to play there as well, although the Japanese international is not as effective down that side as he is centrally. Jessie Lingard provides backup from the Academy, although he currently on loan to Leicester City. Keep an eye out in the coming years for Gyliano Van Velzen, he has by all accounts been making waves with the under 18 squad. This has been something of a problem area for Ferguson. Nani is perhaps better on the right, and Young has been largely ineffective all season. Giggs has delivered some good performances in the wide areas of late, and Rooney has spent a fair amount of time in this position too. Verdict: A signing would be welcome to add depth, but is unlikely to be made. In case of a winger crisis, Sir Alex would most likely revert to a diamond formation and ask the full backs to play as auxiliary wingers. Patrice Evra provides excellent width from fullback, so a more narrow left-sided player is often used. The obvious area of concern for the majority, if not all, United supporters. There is no lack of quantity, as there are plentiful options, but it’s the lack of real quality that is cause for concern. Michael Carrick and Tom Cleverley are the current preferred two in the engine room, and they complement each other well. Darren Fletcher is yet to fully recover his best form after his battle with ulcerative colitis, and Anderson is injury prone and tends to add on a few pounds when injured and not training. Paul Scholes and Ryan Giggs have seen their best years pass them by, as they are regularly overrun by teams when playing together. The departures of Paul Pogba (Juventus), and Ravel Morrison (West Ham, now on loan to Birmingham) were a blow, as they were seen as the best two midfield prospects to come through the Carrington breeding ground for many a year. Ryan Tunnicliffe and Davide Petrucci were in the first team squad for the preseason tours, and made a couple of fleeting appearances. They both featured in the Capital One Cup defeat of Newcastle, with Tunnicliffe also making an appearance at Stamford Bridge in the following round. In the under 18 squad, young Norwegian Mats Daehli is one to look out for in the future. Verdict: A signing is definitely needed. This has been a pressing concern for the last four transfer windows and each time it has been criminally ignored while striking targets, or wide players are prioritised. Possible Targets: Kevin Strootman (PSV), Victor Wanyama (Celtic), Yohan Cabaye (Newcastle), Ezequiel Cirigliano (River Plate), Marouane Fellaini (Everton), Cheick Tioté (Newcastle). Shinji Kagawa was brought in from Dortmund to be the creative link and spark that United were missing in recent seasons. Wayne Rooney has played in that area with great success, while Tom Cleverley has played in the position for England. Nick Powell was utilised by his old club, Crewe, just behind the strikers, but there is a belief at Old Trafford that his best position will be further back in a deep lying playmaker role as he grows into his game. In the reserves David Petrucci as well as Jessi Lingard (before he went on loan) and Larnell Cole have been utilised there. The under 18 squad have exciting youngster Adnan Januzaj creating plenty goals from that position. Verdict: A signing is not a pressing need, but if a top quality player became available at a reduced price, Sir Alex won’t (shouldn’t) hesitate to spend. Possible Targets: Wesley Sneijder (Inter Milan), Isco (Malaga), Christian Eriksen (Ajax Amsterdam), Mesut Özil (Real Madrid). Robert Lewandowski: Top Player, but not in a priority position. There are no doubts in this area as the side is magnificently blessed with four fantastic strikers. F-A analysed the attack earlier this season, and there are options and permutations galore. Robin Van Persie and Wayne Rooney are the front pairing of choice, but Javier Hernández and Danny Welbeck would almost certainly be regular starters at the majority of European clubs. Federico Macheda looks to be on his way out, whilst summer recruit Ángelo Henríquez is on his way to Wigan Athletic in a loan deal until the end of the season. With Arouna Koné at the AFCON, it will hopefully prove a chance for him to gain Premier League experience and game time. William Keane, the promising reserve team striker, looks set to return in the New Year after picking up a serious ligament injury just when he was breaking through into the first team squad, and had made his league debut against Blackburn on New Year’s Eve last year. No strengthening is required in attack, although Polish ace Robert Lewandowski is constantly linked to the club, and was said to be close to joining the club after a report in the usually reliable German newspaper, Bild. Ferguson dismissed these reports as “absolute nonsense”. Nani is the only high profile name linked with a move away this winter, and Zenit St. Petersburg, as well as both Milan clubs and Juventus hold a long standing interest in the player. Ben Amos is on loan to Hull City, Jessie Lingard is at Leicester City along with Michael Keane, Reece Brown (defender) is on loan to Coventry City, John Cofie (striker) is on loan to Sheffield United. Fabio and Joshua King are on loan to QPR and Blackburn respectively. Ryan Giggs and Paul Scholes are rumoured to be retiring at the end of this season, with both looking to get involved in coaching at the club. Giggs has been doing his coaching licenses with Gary Neville and they both have completed their “UEFA A” License and will be progressing to Pro License next year. Scholes previously assisted with the reserves during his short spell in retirement. It’s interesting that as Scholesy says very little so I’m surprised if he spoke to some pal before he spoke to me, which he hasn’t done. So you can dismiss that. I think Giggs can play for another year or two years and Rio’s form has been fantastic. It’s that type of speculation you expect with people on one-year contracts but I wouldn’t give it too much credence. Sir Alex is unlikely to use this January window to strengthen his squad unless one of his targets becomes available or there is a danger of another club moving for someone on his wishlist. Ideally, supporters would like to see a midfielder coming into the club, but that is more likely to happen in the summer window. For now, the current squad covers most bases in terms of depth, and this is helped further by the versatility of Rooney, Fletcher, Carrick and Jones. Most United supporters are looking for an upgrade in quality in the summer, but a quality central midfielder should be the on the agenda immediately. Ferguson has tended to favour signings from other Premier League clubs. Rooney, Van Persie, Valencia, Carrick, Young, Smalling, Jones, Ferdinand etc. were all signed from within the division, as were the likes of Cantona, Berbatov, Andy Cole and Dwight Yorke in the past. This is because these players know what the Premier League is all about, and are able to settle quickly and deliver top performances immediately. Signings made in January, especially from foreign leagues, aren’t always able to do that. A quiet window probably awaits. This is a great article but I just think you’re being a bit harsh on Young.